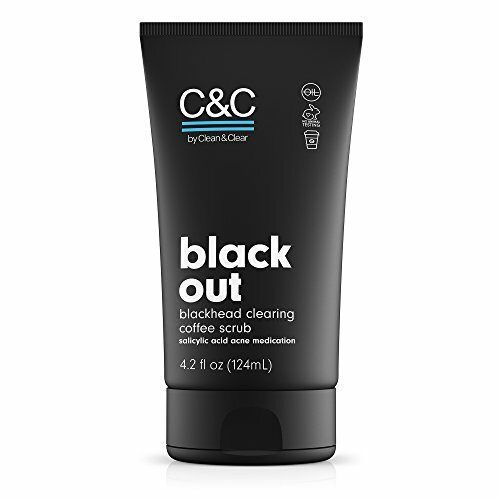 C&C by Clean & Clear Black Out Blackhead Clearing Coffee Facial Scrub with Salicylic Acid, Oil-Free Exfoliating Face Wash for Acne Prone Skin, Not Tested on Animals, 4.2 fl. oz. We worked directly with our customers to develop a clear-cut line of products that smell like a dream and feel downright luxurious-no overthinking required. This oil-free, coffee-scented blackhead scrub is no exception with its gentle exfoliation and deep pore cleansing qualities. It is formulated with salicylic acid to help combat active breakouts, and help keep skin balanced to help prevent future blackheads and acne. The coffee scent and pore-cleansing formula are a perfect start to a busy day, while the exfoliating properties do wonders to remove the dirt and oil that build up while you're out in the world. Oh, and guess what? Like all of our other C&C by Clean & Clear products, this face scrub is never, ever tested on animals. FOR DAILY EXFOLIATION We worked directly with our customers to make sure this blackhead-busting coffee scrub feels and smells just right. One wash that cleanses and exfoliates? Why, that fits right into your busy routine! BLACKHEADS BE GONE This wash smells like a coffee-laced dream and cleanses like a charm. It's packed with salicylic acid to help eliminate acne, while gentle exfoliation lifts dirt, oil, and dead skin. Which means you can say buh-bye to future breakouts. MORNING OR NIGHT Massage a dollop of coffee facial scrub onto your face with a little water, and make sure to avoid the sensitive eye area. Rinse thoroughly. Use this oil-free pore cleanser daily for best results, and don't forget to follow up with moisturizer. EVERY. DAMN. DAY. This exfoliating coffee scrub can kickstart your morning or perk up your pores with a deep clean after a day of classes, practice, and your part time job. Pre-game? Post-party? Yep, it even works then. View More In Acids & Peels. If you have any questions about this product by C & C by Clean & Clear, contact us by completing and submitting the form below. If you are looking for a specif part number, please include it with your message.